2. In an ovenproof sauté pan, heat oil until simmering. Add coated fillets (turning once) and cook until golden. 3. Transfer fillets to glass baking dish drizzled with olive oil and bake about 10 minutes to cook evenly. 4. In a small saucepan, simmer butter; add lemon, garlic, basil, salt and pepper; and reduce for 5-7 minutes. 5. Add cooked crabmeat and pecans and mix. 6. 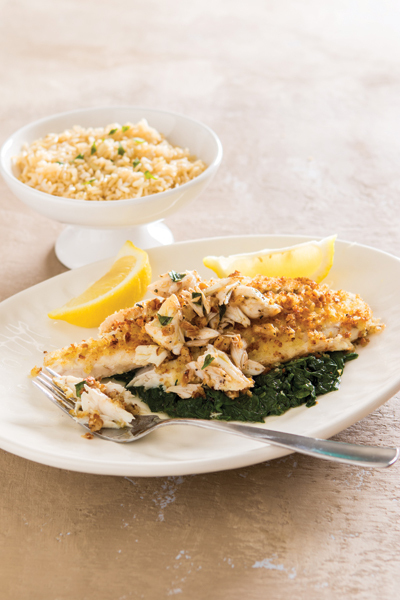 Serve, place fillet over plate of steamed spinach and top with crabmeat mixture. Serve alongside brown rice and garnish with Thai basil or cilantro (optional). A first-generation Thai and Cajun chef, Chef Diana Chauvin Galle has taken time-honored recipes passed down from both her mother and grandmother and adapted them for the New Orleans palette at her restaurant, La Thai Uptown. When she’s not in the kitchen, the wife and mother of two pursues design projects, practices yoga and supports local charities, including the Fore! Kids Foundation, Louisiana SPCA and Eat Fit NOLA.